The ‘Terror from the Sky’ project was initiated by artist and designer Joe Robinson who partnered with Chace Community School and other organisations such as Enfield Local Studies Library and Archive. The title of the project is a summary of the fear caused by the flying bomb and the V2 rocket campaign against London (including Enfield) in the last years of World War II. The aim has been both to rediscover part of Enfield’s lost wartime heritage and to develop ways in which the subject could be used to enrich people’s connection with local community today. 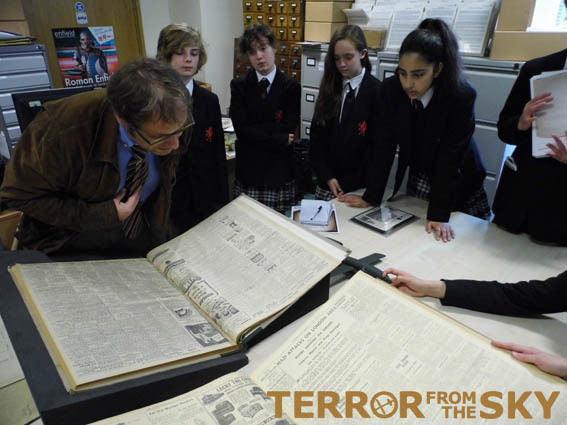 For schools the aim was also to provide a direct local teaching link to a significant worldwide event and to aid students in reflecting on modern conflicts. The initial project involved developing a strong connection between learning and personal experience. Trips to museums and archives were expanded to give a real hands on feel for both the subject and for the professions of heritage and museums. Practical work included an archaeological field dig as well as a visit to the grave of a local wartime pilot. Amongst other outcomes the project developed an education pack which is available to anyone interested locally in the topic. The project also proved that the subject has considerable potential to be expanded and for this heritage to encourage a greater connection between place and community.